I will introduce my friend to come stay . 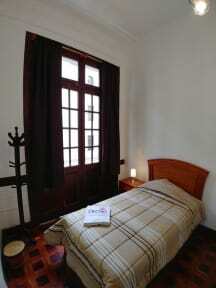 A very lovely hostel to stay in close to the city centre. Literally a stones throw away. The staff were very friendly and helpful and the fact there was a vegan restaurant attached was a big plus in my books. Noisy from the outside, so it was really hard to fall asleep! This hostel was definitely what I needed after some intense stays at party hostels. It’s a really chilled out, nice environment with great facilities. They have big lockers that can fit your backpacks and great beds with power points near the bed. The included breakfast was super delicious and they have a cafe downstairs called ‘Samadhi veggie food’- the food there was absolutely top quality and I’ve been thinking about it ever since. We arrived late on a Saturday night and the hostel is next to a nightclub so we didn’t sleep very well even though the beds were comfy. Each bed has a personal light and plug as well as huge lockers which was great. The common areas were really nice and the showers were amazing and hot. We weren’t impressed with the breakfast, it was very basic. 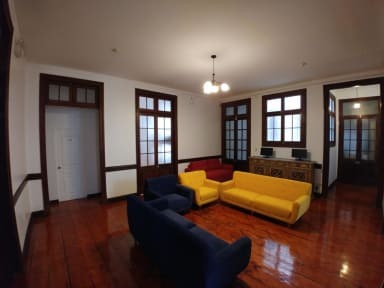 The hostel is super central although if you want to explore Barranco and Miraflores like us, it was about a 25 min drive to those areas. Very loud because of a club next door. Also, the bathroom walls do not go all the way up to the ceiling and it’s close to the from desk so very uncomfortable to use and people can hear you from the lobby/common area!